I am trying to create a view where we have each project name listed, and then there are 3 lines shown within each project to represent 3 separate timelines. Is there a way to do this so I can achieve the following structure? A sample workbook is attached. i want to have Project name where the assigned is, timeline in the project column (for example timeline 1, 2, or 3) and then the respective bars going with those timelines for each project. I took a look in your workbook but I don't see a date field that contains all dates for the projects (you have separated date fields with only the Start and End dates). In order to create a timeline you need a field that contains all the datapoints for the timeline. Also you don't need one date field for each project start. You can do that with the unique date field by using MIN and MAX dates for each project. Those will be your Start and End dates. That way I suggest you to reshape your dataset so all dates are in one continuous field. I was able to accomplish what you're looking to do by pivoting your data. I pivoted all 6 date columns so that you now have a single column for your dates and a column (I'm calling it Date Type) that says what type of date it is (Start 1, Start 2, etc). I put DAY(Date) on the columns shelf (make sure its continuous), Project on Rows, and Date Type next to Project on Rows. I also put a copy of Date Type on the color shelf. 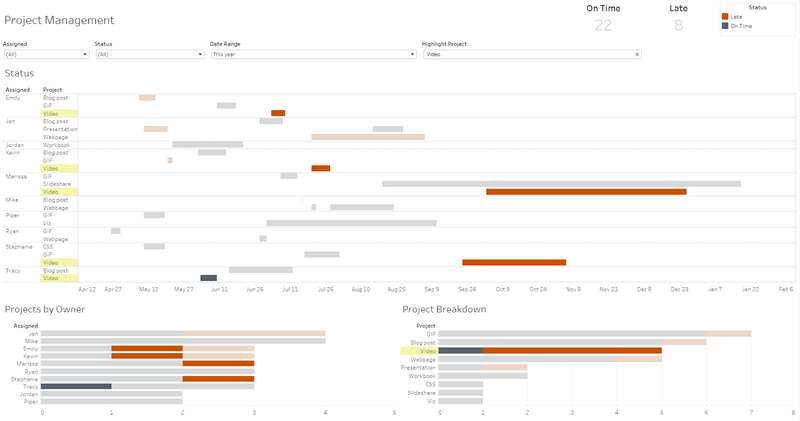 Place duration on size and it'll give you the projects separated by row for each project.